Described as one of the ‘Top 10 Wine Travel Destinations 2016’ by the Wine Enthusiast Magazine, Höpler’s Winerooms offer a sensory tour to awaken your inner conscience to the world of wine. 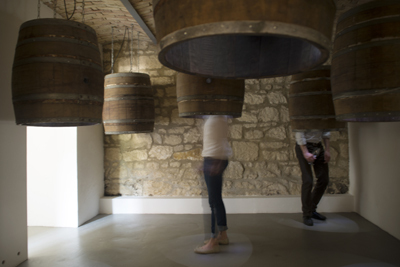 8 wine rooms introduce you to a different aspect of wine. The aim: to break down the barriers that can make the world of wine intimidating and give you the confidence to form your own opinions. Link to the article "Top 10 Wine Travel Destinations 2016" by Wine Enthusiast Magazine. It is also a wonderful location for an event. Hoepler’s Wine Rooms are located in northern Burgenland, in the Leitaberg Hills on the western shore of Lake Neusiedl. It makes for a perfect stop whether you are on route to the Moerbisch Festival, a visit to Esterhazy Palace in Eisenstadt or simply enjoying a cycle ride around the lake. Hoepler’s Wine Rooms are a secret tip for a wonderful day out. Tours which include a tasting can be arranged by contacting us at info@weinraeume.at. A mimimum of 6 people required. The Wine Rooms, including the beautiful, private and peaceful courtyard garden, are also available for hire. If you wish to hold a presentation, run a team building session for your colleagues, celebrate a Christmas party or importantly your dream wedding, Hoeplers Wine Rooms offer the perfect location. Please contact us at info@weinraeume.at.